Washington, DC (February 25, 2010)- Congressman Steve Cohen (TN) has introduced H.Con.Res. 240, a resolution designating the fourth week of April as National Streetscaping Week. The measure recognizes the benefits of streetscaping to homes, businesses, and communities across the country. ACT applauds Congressman Cohen for introducing this measure and working to raise awareness of the importance of streetscaping and green infrastructure in creating desirable places to live. The legislation highlights the myriad of benefits of streetscaping including: creating local green jobs, helping reduce energy costs for consumers, managing stormwater, reducing air pollution by sequestering harmful carbon emissions, creating safer streets and neighborhoods through traffic calming designs, and a host of other benefits. More importantly, the resolution helps to highlight the work of landscape architects. Landscape architects design streetscaping projects and other green infrastructure projects to make our communities more economically viable, more attractive, and environmentally healthier for their residents. 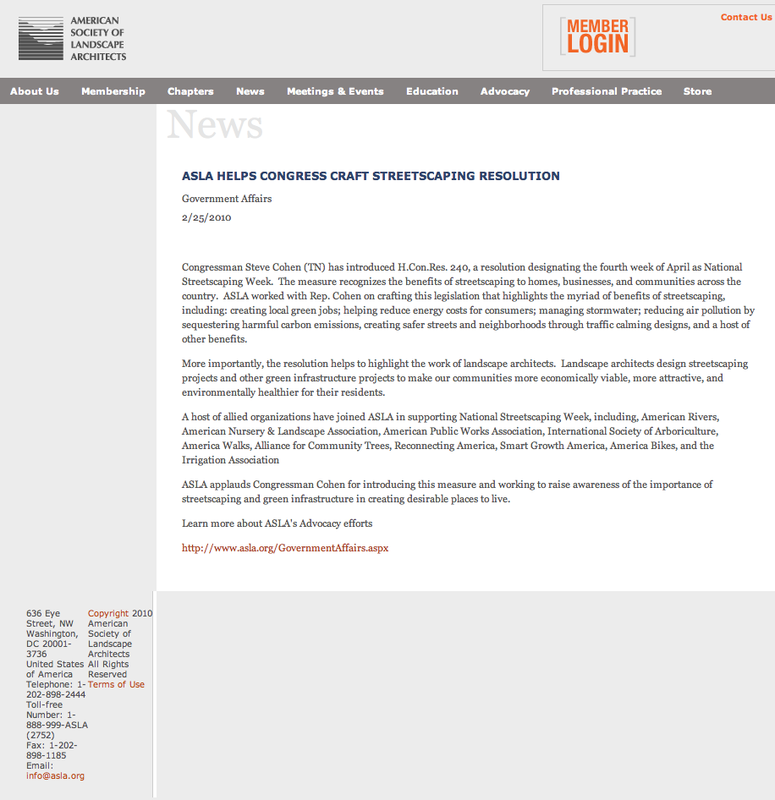 A host of organizations have joined in supporting National Streetscaping Week including ASLA, Alliance for Community Trees, American Rivers, American Nursery & Landscape Association, American Public Works Association, International Society of Arboriculture, America Walks, Reconnecting America, Smart Growth America, America Bikes, and the Irrigation Association.